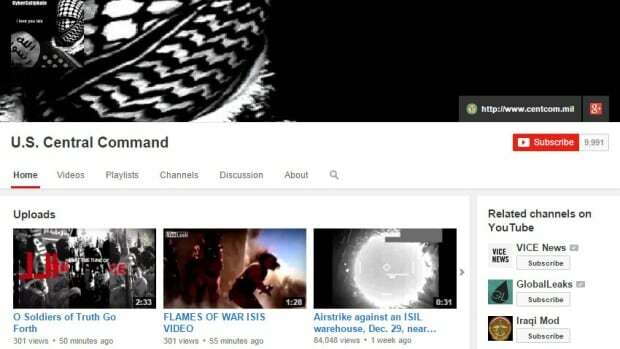 The Twitter and YouTube accounts of the military's U.S. Central Command were taken over Monday by hackers claiming to be working on behalf of Islamic State militants. American and coalition fighters are launching airstrikes against the group known as ISIS, or Islamic State in Iraq and Syria. Canada is participating in the mission in Iraq by conducting airstrikes and helping to train Iraqi soldiers. The first message on the hacked Twitter account appeared around 12:30 p.m. ET. "American soldiers, we are coming, watch your back," read one message. Other postings appeared to list names and phone numbers of military personnel as well as PowerPoint slides and maps. A Central Command spokesperson confirmed Monday afternoon that Twitter and YouTube accounts had been compromised earlier in the day and said "appropriate measures" were being taken to address the issue. An initial assessment indicated that no classified information was posted, the spokesperson said. "This is little more than a prank or vandalism. It's inconvenient and it's an annoyance. But that's all it is," Col. Steve Warren, a Pentagon spokesman, told The Associated Press. "It in no way compromises our operations in any way, shape or form." Shortly after the messages appeared, the @CENTCOM Twitter account was suspended along with the YouTube channel. Propaganda-style videos had been added to that account. The sites — which are on commercial servers — were "compromised for approximately 30 minutes," but were kept offline while investigators looked into the incident, Central Command said in a statement Monday evening. As of 8:30 p.m. ET, the sites were still unavailable to the public. The hackers titled the Central Command Twitter page "CyberCaliphate" with an underline that said "i love you isis." And the broader message referred to the ongoing airstrikes against ISIS and threatened, "We broke into your networks and personal devices and know everything about you. You'll see no mercy infidels. ISIS is already here, we are in your PCs, in each military base." White House spokesman Josh Earnest told reporters that officials are looking into what happened and it is being taken seriously. He noted that Central Command's databases and website were not hacked, only social media website accounts.